We are still a long way, unfortunately, from the usual splendor of Christmas light shows, but that’s not really an issue, because one house has all the lights you need for a Halloween spectacle. 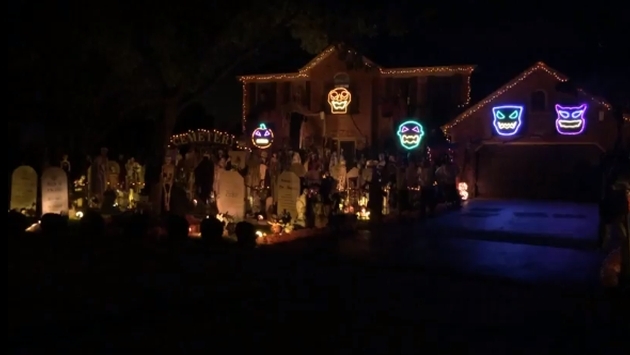 The Chicago Tribune’s Gary Gibula (h/t The Huffington Post) spotted one of the more amazing Halloween light shows posted to YouTube, produced by Nick Thomas (60) who with the help of the neighbor’s 25-year-old son, Steve Jandick, has produced a wonder we can appreciate far away from Naperville, Illinois, where the show takes place. For those wondering, Gigi’s Playhouse is an organization that helps those with Down syndrome. If you want to catch the light show, the report states it all goes down on the 1100 block of Conan Doyle Road, starting at six at night during the week, running until 9:30 p.m.
Now on the weekends, you get a little extra as it all shuts down at 10:30 in the evening, although the actual lights will continue to glow until the stroke of midnight. The pageantry of household lightshows is usually reserved for winter nights, but we are more than willing to accept early entries for the holiday season—especially ones as magically ghoulish as the one in Naperville.